I spoke too soon, I guess, in my post "Shimla - why can't South India be like it?" 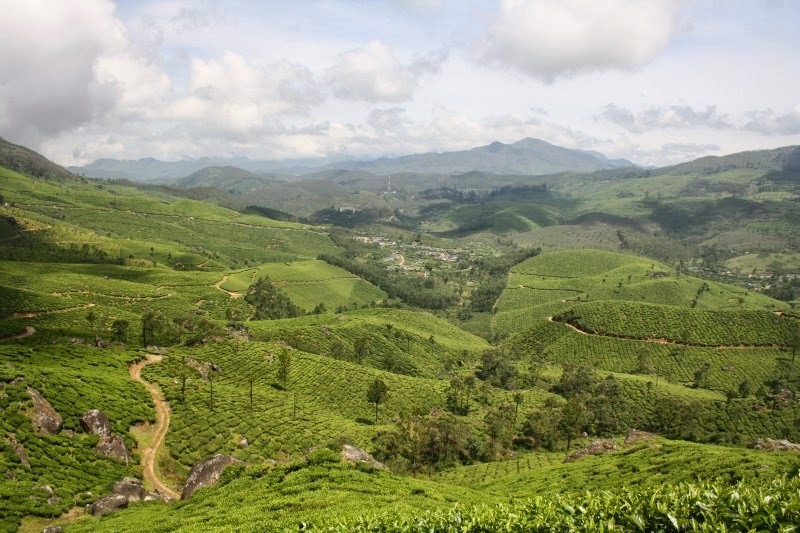 - where I rued the lack of clean tourist-friendly hill stations in South, by comparing Shimla with Ooty (Udhagamandalam), Kodaikanal, Yercaud and Yelagiri. Recently, visited Munnar, which has changed my opinion. We do have a gem of a place at Munnar. It is clean, still not exploited by commercial interests that destroy the environment / ecology (tea estates abound but they are not spoiling the ecology or environment). Munnar is very scenic and calm place for a long relaxed vacation. There are quite a few naturally enjoyable spots with variety of valleys, lakes, waterfalls, tea estates, reservoirs, flora and fauna. (a) Beautiful green plantations, valleys - with some mountains and clouds kissing them. (b) Tourism related exploitation of land is very less. Very few resorts and well spread out. (c) Smaller town compared to other South Indian hill stations. (d) Cleaner - no plastic, less non-plantation exploitation of nature. (e) A couple of kilometers out of Munnar onwards, if one looks out in the evenings / nights, hardly a few lights dot the whole landscape - hence we are sure we are surrounded by forests, plantations and nature. (f) Many waterfalls, lakes and reservoirs dot the nearby areas. (g) Trekking through various places - variety of options. Good place for birders too. (h) High view points of Kerala and Tamilnadu. (i) Clean air, mists in the morning, clouds and mist kissing us often, comfortable weather, etc. Munnar is a very good place to go for a vacation & recharge ourselves after being drained by the rigours of our busy corporate lives. Hope locals and tourists alike continue to maintain this pristine place on the Western Ghats. Hi, this is one of the nice post. Thanks for sharing this post. If you want Travel To Rajasthan some offers for you. I like the way you writing the post..
we have a best South India Vacations plans,that will be very helpful for India tour. India is really a magical country. I want to visit India; please help me to find Best India Tour Packages and offers. India is one of the best destinaton place where tourist can get natural beauty so I would like to suggest for south India tours because it is remarkable place. MakeYouTravel is Travel Agency in Delhi, which provides Holiday Packages for India and Holiday Packages for International with affordable cost. Day Picnic Near Delhi , Picnic Spots Around Delhi , Day Outing Near Delhi Comment Thanks for sharing good information! Chennai Balaji Travels and tourism is one of the leading travel agents and tour operator in Chennai offers Chennai to tirupati car packagewith reasonable price. We provide Chennai tirupati one day tour package with boarding and loading. We are the most successful and tours providers in Chennai. Our main motto is customer satisfaction only. Very well said. You have provided the most simplest but informative and helpful ways about South India. I really learned a lot.Munnar is very scenic and calm place for a long relaxed vacation. There are quite a few naturally enjoyable spots with variety of valleys, lakes, waterfalls, tea estates, reservoirs, flora and fauna. Visit South India with South India Travel Packages offered by SplendourHolidays. Good post. Munnar is famous hill station in south India. Munnar is very good place for vacation. If you are planning for best South India Vacations then visit splendourholidays and choose your favorite place for your vacations. Its very true that it is clean hill station of south India. This hill station in God's own country is known for its serenity and remarkable beauty. Set amidst thriving green tea plantations, exotic wildlife and clear trout streams, Munnar is a delight for adventure seekers. Check all places to visit in Munnar.